After my 40 days of vegetarian diet, I was dying for lok-lok. I went to Padang Brown for lok-lok but I was going to eat alone as hubby hates lok-lok. I don’t have the heart to ask the uncle to set up a table just for me alone. So, I took a bunch of these super geli, super icky innards and bloodied foods. These consist of fallopian tube (or at least that’s what they told me) of the swine. 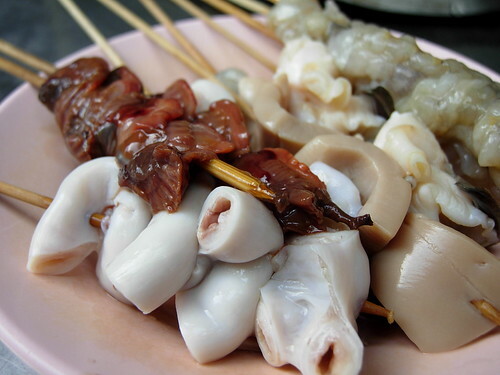 It is not intestine but some crispy tube, kidney, cockles, mantis prawns, squids and some shell fish. All these will probably shorten my life by several years. 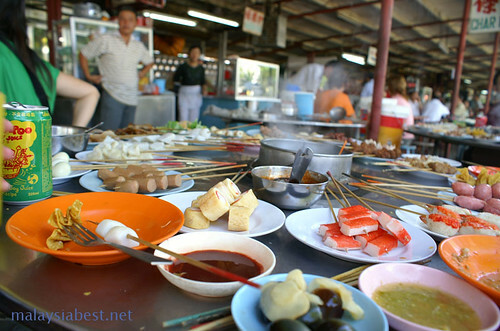 Besides these, are the pig’s ears, century eggs, all parts of the pigs, prawns, fish, meat and many quirky stuffs. The above sticks of funny and weird looking foods will be immersed in hot, boiling water and then, dipped into these sauce. It is one of the most enjoyable way of eating. 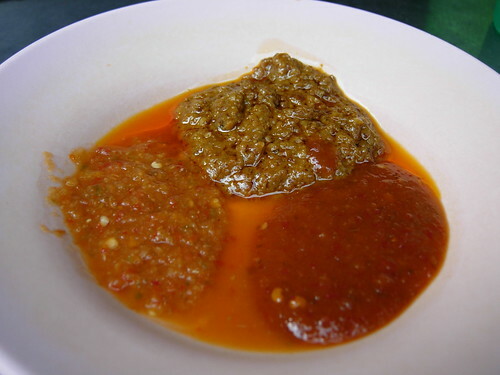 The above is how lok-lok, or in English means dip-dip look like. We have a table with a huge pot of boiling water in the middle and plenty of foods stuffs to be cooked on our own. Those who do not have a strong stomach may need to make a run for the toilet the next day. But over here, our guts are handled to deal with anything.